One part of the home that often goes unnoticed by many homeowners unless something goes wrong is the roof. But your roof and more specifically, your roof shingles play a very important role in both the beauty and the well being of your home. Roofing shingles can be made of many different materials and each of the possibilities brings it own advantages and disadvantages. Choosing the right kind of roofing shingles for your home depends on factors such as the climate you live in, the pitch of your roof, the strength of the roof, building codes such as flame retardant specifications, and your budget. Most people only need to make a decision about what kind of shingles they want for the roof if they are building a new home, but sometimes roofs need to be replaced as well. Once you have chosen the roof shingles you want, you will need to take care of them and roof maintenance varies depending on the shingle material. 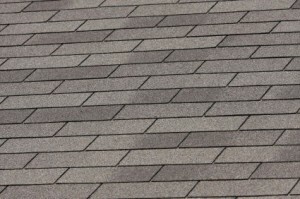 By far the most popular kind of roofing shingle is the asphalt shingle. The reason for their overwhelming popularity is that they are relatively inexpensive, very durable, and easy to install. There are two kinds of asphalt shingles to choose between. The first is an organic asphalt shingle and the second is a fiberglass asphalt shingle. Organic shingles are made by starting with paper that is saturated in asphalt to make it waterproof. Then an adhesive layer of asphalt is added along with ceramic granules embedded on top. Fiberglass shingles on the other hand have fiberglass mat as the starting point rather than paper. Overall, fiberglass shingles are more flame retardant and used more often for that reason. In addition to their flame retardant properties, fiberglass shingles have a higher tear value so they are more appropriate for climates that might experience high winds from hurricanes or tornados. Asphalt shingles usually last longer and do better in cooler and more temperate climates. Thermal shock, or when the temperature varies drastically in a very short period, can damage shingles. So considering the climate, you will find that asphalt roofing shingles generally last anywhere from twenty to fifty years. Regular roofing inspections will make sure that your roof is at the longer end of that spectrum. Roofing services can make sure that your asphalt roofing shingles are in good condition once a year and extend the life of your roof in general by catching possible problems early. Another type of roofing shingle is the tile roofing shingle. 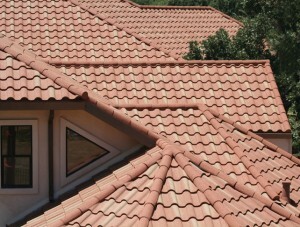 Tile shingles come in many varieties including slate tiles, clay tiles, and concrete tiles. In general, tile roofing shingles provide the best fire protection because they are not flammable and they are much more durable and can withstand more fierce winds and abuse than asphalt shingles. In addition, tile shingles require less maintenance than other roofing shingle choices. However, tile roofing shingles are more expensive than asphalt ones no matter what material you choose. Slate roofing tiles are considered the best roofing shingle material you can choose. 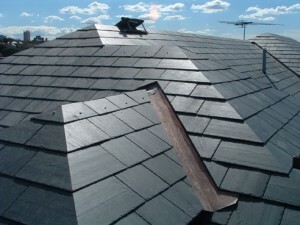 Slate comes in a wide variety of colors and textures so you can get a unique look for your roof. Slate is a natural material that will last indefinitely. The real lifespan of a slate tile roof is determined by the structure, not the roofing shingles. Slate is very heavy so it is important that the roof be constructed in such a way as to be able to hold the weight. The slate is not only fireproof, but also water repellent so it can withstand the harshest of weather conditions. Concrete roofing shingles are less popular than slate, but they have many of the same characteristics. For example, concrete is also fireproof and can withstand high winds, rain, and other harsh weather conditions. Older concrete tile roofs contained asbestos, but regulations prohibit the use of asbestos in construction now so concrete roofing shingles are safe. Clay tile shingles are quite popular in warmer climates because clay does not absorb the sun’s heat and therefore your house will be easier to cool. Clay tiles come in two possible shapes. Some are regular roofing shingle shapes and others are curved, sometimes called barrel-shaped, providing texture to the roof. 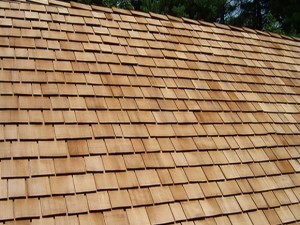 Clay tile roofing shingles will last anywhere from 70 to 90 years. However, you cannot use clay roofing shingles in cold climates where the temperature gets below freezing because the clay will crack due to water damage. Wooden roofing shingles, and in particular, cedar roofing shingles, is a good choice because of the aesthetic appeal, but a bad choice in almost every other respect. Wood can rot easily if it is exposed to too much water. Insects could eat through the roof or cause major structural damage. In addition, wood shingles are flammable. All of these complications mean that if you have wood roofing shingles you will have to spend a large amount of time on maintenance to keep on top of all the possible pitfalls. One of the most important standards for roofing shingles is the fire rating. Underwriters Laboratory (UL) has come up with a scale that rates roofing shingle materials anywhere from an A to a C. An A rating means that there is a high degree of fire protection, Class B means that there is a moderate degree of fire protection, and Class C is only a light degree of protection from fire. None of these ratings will guarantee that the roofing shingles will not eventually succumb to fire. However, knowing that you have a Class A fire rating means that you will have that much more time before it does. Roofing shingle maintenance is best left to professional roofing services. If you hire a roofing service, they will come to your home once or twice a year and inspect all areas of your roof in order to determine if any repairs are needed or if any repairs will need to be made in the future. They will also clear debris and any possibly harmful elements from your roof just in case. Many roofing shingle warranties are null and void if you do not keep up with regular roofing maintenance, so it is very important.